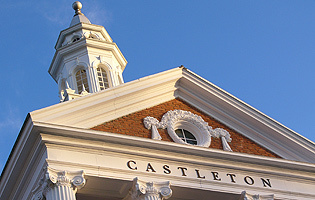 Castleton, the 18th oldest institution of higher education in the United States, emphasizes undergraduate liberal arts and professional education while also offering selected graduate programs. The College is dedicated to the intellectual and personal growth of students through excellence in teaching, close student-faculty interaction, numerous opportunities for outside-the-classroom learning, and an active and supportive campus community. Castleton strives to learn, use, and teach sustainable practices. The College prepares its graduates for meaningful careers; further academic pursuits; and engaged, environmentally responsible citizenship. As a member of the Vermont State Colleges, Castleton is committed to supporting and improving the region's communities, schools, organizations, businesses, and environment. Castleton is located in an area that has long been recognized for its beauty, unique character, and recreational resources. The natural environment of Vermont blends easily with the educational environment of Castleton to create the setting for a unique living and learning experience. The college's 165-acre campus is situated in the village of Castleton. One of Vermont's largest cities, Rutland, lies 12 miles to the east; New York State is six miles to the west. Montreal, Boston, Hartford, Albany, and New York City are all within easy driving distance on major highways and are accessible by air, bus, and/or train service. Castleton provides an academic experience that draws from two of the college's greatest strengths. On the one hand, students can enjoy the benefits of small classes in a rural setting and Castleton's two hundred years of tradition. On the other hand, they can profit from contact with highly qualified faculty who are strongly encouraged to develop their teaching skills and research interests. These attributes of the institution receive support from fine academic facilities, particularly an excellent Information Technology Services Center whose growth in recent years in quality and quantity of hardware and software is matched by student and faculty interest. These ingredients, combined with a diverse population of in-state and out-of-state students, provide variety and challenge for all on a very personal level. Castleton is primarily a teaching institution whose faculty is dedicated to the preeminence of student learning in the life of the college. Castleton faculty comprise a community of scholar-teachers whose academic and artistic endeavors enlarge and enrich the lives of their students, their colleagues, and the college. Ninety-three percent of the faculty hold doctoral or appropriate terminal degrees in their field of academic specialty. Excellence in teaching requires that professors continue to learn to reexamine established canons of thought and belief, and to expand the frontiers of knowledge through continued study, scholarship, and research. The chief beneficiary of faculty scholarship is the Castleton student, whose classroom experience is heightened by the shared excitement of the professor's own pursuit of knowledge. 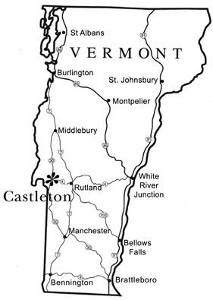 Castleton State College's roots go back to October 15, 1787, when the General Assembly of the State of Vermont chartered the Rutland County Grammar School in the village of Castleton. In early America a grammar school was the first step in higher education, a link between the local common schools and the few colleges in New England. Of institutions that are colleges today, Castleton is the oldest in Vermont and the 18th oldest in the nation. The village of Castleton was an intellectual center. The first medical college in Vermont was founded here in 1818 and lasted until 1862. In that time the school conferred some 1400 medical degrees, more than any other New England medical school. Students came from throughout the United States, from Canada, and from distant lands including France, Cuba, Ireland, and Brazil. At least two African-Americans graduated and went on to distinguished careers. Throughout the 19th century, the school in Castleton evolved and changed names to meet the needs of society. In 1829 the cornerstone of the historic Old Seminary building was laid by Solomon Foot, principal of the Classical High School and later president pro tempore of the U.S. Senate during the Civil War, and Colonel Noah Lee, an early settler who had been with Ethan Allen at the capture of Fort Ticonderoga. In the 1860s, Harriet Haskell, later a nationally known feminist, served as Castleton's first woman principal. In 1867 the State Normal School was founded in Castleton. For a few years it was housed entirely in the old Medical College building and shared faculty with the Castleton Seminary before that school closed. Normal school is a term based on the French école normal, a school to educate teachers. For 30 years Abel Leavenworth, a Civil War hero, and son Philip Leavenworth were principals of the State Normal School. In 1912 the State of Vermont purchased the property. Castleton entered a Golden Age in the 1920s and 1930s under the leadership of Principal Caroline Woodruff. She helped save the school after the Old Seminary building burned in January 1924. Quoting the Old Testament's book of Haggai, she promised, "And the glory of the latter house shall be greater than that of the former." Woodruff modernized the curriculum, hired excellent staff, and exposed her students to the wider world through guest speakers, who included Robert Frost, Helen Keller, and Norman Rockwell. A friend of Eleanor and Franklin Roosevelt, she is still the only Vermonter to be president of the National Education Association. In 1947 the Normal School became Castleton Teachers College. With increased enrollment from men, intercollegiate athletics began in the 1950s, and by the early-1960s Castleton was a national power in small college men's soccer. In 1962 Castleton became a state college and a member of the newly formed Vermont State Colleges. Castleton grew dramatically during the decade of the Sixties in enrollment and in construction of buildings. A generation of faculty educated at major universities brought new perspectives to the classroom. Many academic programs were added to meet the changing needs of students and of society. Today Castleton has a total enrollment of more than 2000 students. The college offers more than 30 undergraduate programs as well as master's degrees in education and accounting. First-year students benefit from the First-Year Seminar program and Soundings, which offers the best in music, drama, dance, and contemporary thought for the campus. The college is deeply involved in the region through community service efforts and internships and through its education, social work, and nursing programs. Although so much has changed in 225 years, Castleton retains its historic commitment to students and to Vermont.